Following the success of the first edition, this new edition has been expanded and improved with additional images and enhanced drawings. The subject matter has been expanded with the chapter on grammar and pronunciation extended. There are examples of how Gaelic personal names and the human body are used in place-names and many etymological sources have been added to place-name tables. In addition to the generic index, there is now an index of specific place-names. Finally, there’s more to say about hares, bears and boars! Reading the Gaelic Landscape is essential for anyone who is interested in the Scottish Highlands and its native language. 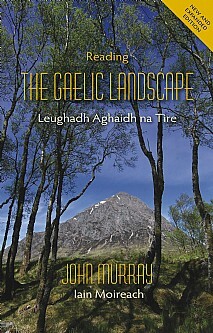 It enables people to read and understand place-names in Gaelic, providing insights into landscape character and history. The book enriches the experience of walkers, climbers, sailors, bird watchers and fishers by sketching the named context, where they practise their pursuits. Outdoor enthusiasts need no longer struggle with unfamiliar spellings and words, as they can develop a new perspective of place through an understanding of Gaelic toponymy. A wide audience including outdoor enthusiasts such as walkers and climbers but also anyone with an interest in place, language and culture.